Corrine Malcolm notched an impressive win at the US 50 Mile Trail Championships over the weekend. Despite hot and humid conditions, Malcolm’s time of 8:18 on the Cayuga Trails 50 course was the second-fastest ever, trailing only Amanda Basham’s CR. Relatively new to the ultra scene, the 26-year-old Malcolm is quickly gaining experience and improving her performances. She says, “[I have] a bad sweet tooth and a fierce competitive streak. I’m notorious for fueling long runs with baked goods, and I’m passionate about donuts, puppies and adventure.” Read on to learn more about her background and her rise in the sport. 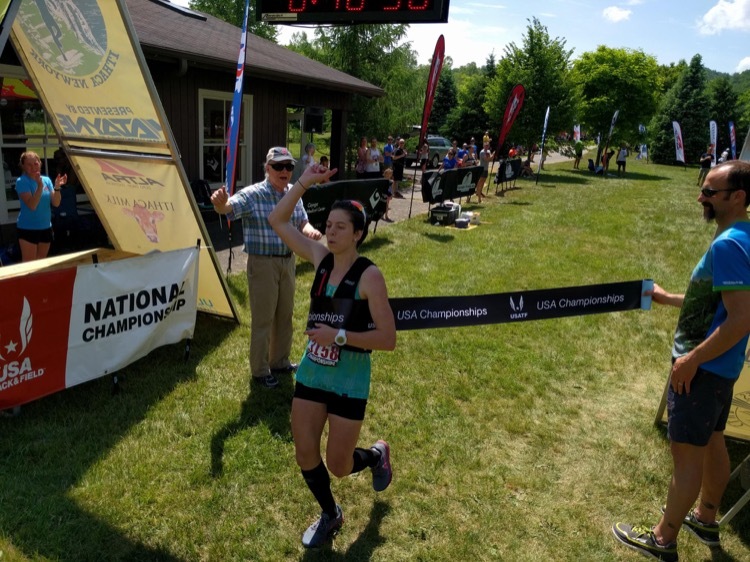 Quick & Dirty: First off, congrats on the US 50 Mile Trail Championships win at the Cayuga Trails 50! I believe you were in front every time I saw you, smiling and looking excited to be running. When did you first move into the lead? Did things go to plan? Corrine Malcolm: I’m glad to hear I looked happy, it definitely didn’t always feel easy! These type of out and back/looped courses are really fun because you get to cheer for people, and that gives me bursts of energy. I’m actually pretty hoarse now from cheering so hard for so much of the race. I moved into the lead at mile 19. Going into the race I never intended to lead early, and honestly I didn’t have a plan for being at the front, let alone going solo for 30+ miles. I knew I could be on the podium, and believed I had a chance at winning the whole thing especially in tough conditions that would play to my strengths. The plan was to smile the entire time, to drink fluids continuously, and to be tough. Essentially, only worry about the things I could control and allowing myself to roll with everything else. I battled a crampy left quad and foot from mile 21 on and had to make some impromptu pit stops in creeks along the course to stay cool. Q&D: This was only your second race over 50 kilometers, the first being the Gorge Waterfalls 100K in April, where you were 4th female. What did you learn from Gorge and how did that affect your training and race plan for Cayuga? CM: The spring was a lot of firsts for me, Chuckanut 50K was actually my first 50k as well! Gorge was a bit of an experiment. My coach and I were looking for a long race to focus on for the spring and Gorge happened to fall on my birthday. It’s pretty hard to turn down 62 miles for your 26th! I’ve never been a super high-mileage runner; in the past year I think most of my training weeks were in the 40 to 50 mile range. I think the biggest lesson from Gorge was just the realization that I could handle the distance. We pumped up my mileage a little bit in the buildup to Cayuga with an 85-mile and 100-mile training week, which contained back-to-back long runs that totaled 40 to 50 miles. I had a lot of fun at Gorge and I wanted to channel that same type of energy into Cayuga, even if it didn’t always feel great. Q&D: You’re relatively new to ultrarunning, but you come from a competitive sporting background, having competed at a world-class level in the biathlon. Can you tell me a bit about your past in the biathlon as well as your running background? CM: I’ve always been active and competitive. From racing my brothers to the car to playing team sports I think I’ve always been trying to outrun someone. In a series of rather fortunate accidents (namely continually hurting myself) I found skiing during high school. During a year abroad to Latvia when I was 16, I really fell for skiing, actually winning a national championship race in the 5km classic, and was introduced to biathlon for the first time. After graduating high school I moved to Bozeman, Montana to ski for Montana State University and actually ended up running cross country for the Bobcats as well. We had an incredibly good ski team and although I qualified for NCAAs I never got to race at the championships because schools are limited to three men and three women. I felt like I wasn’t getting an avenue to be as competitive as I wanted to be and was conveniently recruited by US Biathlon and the Maine Winter Sports Center. So I dropped out of college and moved across the country. Things went really well that next year; I represented the US at the Junior World Championships and at the European Championships, and 10 months later was named to the Senior Women’s National Team. Unfortunately, that’s where the good stuff ends. I was 21, the youngest on the team, and trained really hard to keep up with my older teammates. It was like the finish line kept moving down the road and it was all I could do to hang on. I felt a lot of pressure to perform, and although I produced some relatively good results I was sick frequently. Going into the Olympic year I was named to the list of athletes they would chose the Olympic team from, but I had my funding cut and it was a struggle to make the venture financially sustainable. I continued to push forward but ultimately my health finally found its last straw and I was too sick to race at the second phase of trials. So while my teammates raced in Sochi I returned to MSU and finished my undergraduate degree. After taking almost a year completely off, my competitive urges started to come back. I had always loved trail running and decided I really wanted to see what I could do in the mountains. In 2015 I was introduced to David Roche who agreed to be my mentor and enthusiastic support crew. We focused on the US Sky Running series last year and I had a lot of fun challenging myself! I believe to be a good skier you have to be really good at suffering, and I think that transitions really well to sky and ultra running. Q&D: You’ve lived a variety of places (both domestically and abroad), but you’re now based in Bellingham, WA and attending graduate school in British Columbia. What are you studying and how do you like the Pacific Northwest? CM: I moved to the PNW in January to attend Simon Fraser University in Vancouver, BC. At SFU I work in the Environmental Physiology and Performance lab and should graduate with a Masters in Biomedical Physiology and Kinesiology (read: fancy exercise science) in 2017 before going onto hopefully work on my PhD. I’m actually working on a research project for the summer looking at fatigue and recovery pre- and post-50k mountain ultra, utilizing the Knee Knackering 50K held annually in July on the North Shore. Despite the rain, it’s been a great first winter and spring here. Getting to run on dirt all winter was totally novel and awesome, and I have an incredible community of women to train with! I feel a bit spoiled getting to split my time between Bellingham, where my boyfriend trains as a cyclist, and Vancouver for school, as we get the best of both worlds. Q&D: With your US Championships win, you’ve earned a spot on Team USA for the IAU Trail Ultra World Championships in Geres, Portugal. Will that be a focus race for you? Any other big racing plans this year? CM: Portugal will definitely be an A race! I hadn’t really analyzed the course until I found out I made the team, but with 4,500 meters of climbing I think it could be a really good race for me. It’s a good thing I live in the PNW, as vert is really easy to come by around here. The rest of my race calendar is still a little up in the air. I’ve got my eyes on the Audi Power of Four 50K, The Rut 50K, and TNF 50 Mile in San Francisco, but will have to wait and see how a couple of things play out before I start to lay out my race schedule for the rest of the summer and fall. I’ve got a lot of races on my radar, a growing bucket list, and some adventurous routes planned for the Cascades and the Costal BC range. Basically, I could use a few more days in the week! You can follow Corrine’s adventures on Twitter / Instagram (@corrinemalcolm) and her website, CorrineMalcolm.com.